Krazy Alienz is a space invaders clone for the Xbox Live Indie Section. Immediately you’ve a picture of the game, and I also formulate an opinion. You see, I’m not a huge fan of Space Invaders, so when I was given a copy to review, I was wondering how much I can write about a clone of a game I’ve played (and you have played) a million times before. 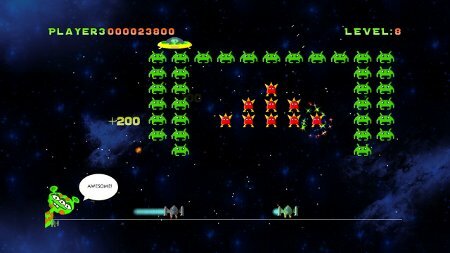 The game has bright graphics, with plenty of particle effects & things going on on screen, but the game is basically Space Invaders. However, there are powerups – slow down the aliens as well as the useful “rewind” (returns the aliens to the top of the screen). There are also “power downs” – make the aliens small or make them double hit. The powerups/downs are dropped by the UFO that goes across the top of the screen in the form of plasma balls. So taking out the UFO, whilst scoring points, means you don’t get the power ups. It’s a nice touch. Once you learn which color is a power up & a power down, it adds a fantastic addition, dodging bad plasma balls & bullets as well as normal ones. Plasma balls can be shot, destroying them. If you get the flashing plasma ball, you have a go at the bonus stage at the end of the level on completion. This is where it gets confusing. These plasma balls can kill you, so in the bonus round you need to shoot the balls, rather than collect them. This confused the bejesus out of me, but that being said it’s a bonus stage, rather than a game stage. As well as the normal mode, there are two other game modes. 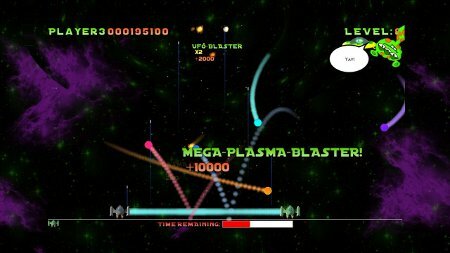 Plasma Ball mode is the same as the bonus stage, but the idea is to score as many points as possible. The other game mode is Skill Shot, which is brilliant. One alien is flashing and you need to shoot that one and that one only. Kill any of the others and you die. It’s a nice twist, and there’s different formations on this mode. Can be tricky and nervy, killing higher up enemies before killing lower enemies. Overall the game is a fun distraction. It’s not going to set the world alight, but as far as Space Invaders clones for the Xbox this is one of the best. For 80 points it’s well worth picking up.